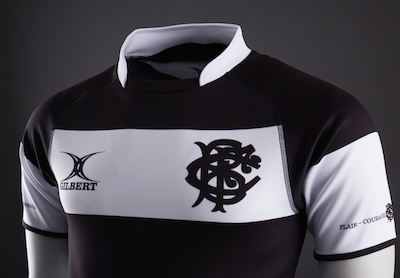 The Barbarians have signed a long-term agreement with Gilbert Rugby, who are the official and exclusive kit supplier to the famous club. The new match shirt design has been created with a nod to the heritage of the Barbarians and famous men’s and women's players who have pulled on the black and white hoops since the club’s inception in 1890. Clean, uncluttered, identically sized hoops wrap their way around the jersey’s body, culminating at the collar where, framed by a field of black, the wearer’s physique triangulates to lend an imposing visual weight to the shoulders. Famous Barbarian player names are etched into the shirt numbers, further creating a link between past and present and underlining the way the club brings together the greats of the game. The brand new range of Barbarian FC kit is available now.